1. Eat lots of vegetables. From a simple plate of sliced fresh tomatoes drizzled with olive oil and crumbled feta cheese to stunning salads, garlicky greens, fragrant soups and stews, healthy pizzas, or oven-roasted medleys, vegetables are vitally important to the fresh tastes and delicious ﬂavors of the Med Diet. 4. Eat seafood twice a week. Fish such as tuna, herring, salmon, and sardines are rich in omega-3 fatty acids, and shellﬁsh including mussels, oysters, and clams have similar beneﬁts for brain and heart health. 5. Cook a vegetarian meal one night a week. Build meals around beans, whole grains, and vegetables, and heighten the ﬂavor with fragrant herbs and spices. Down the road, try two nights per week. 6. Use good fats. Include sources of healthy fats in daily meals, especially extra-virgin olive oil, nuts, peanuts, sunﬂower seeds, olives, and avocados. 7. Switch to whole grains. Whole grains are naturally rich in many important nutrients; their fuller, nuttier taste and extra ﬁber keep you satisﬁed for hours. Cook traditional Mediterranean grains like bulgur, barley, farro and brown, black or red rice, and favor products made with whole grain ﬂour. 8. For dessert, eat fresh fruit. Choose from a wide range of delicious fresh fruits — from fresh ﬁgs and oranges to pomegranates, grapes and apples. Instead of daily ice cream or cookies, save sweets for a special treat or celebration. 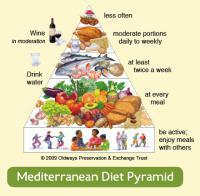 Check out our resource, Welcome to the Mediterranean Diet. 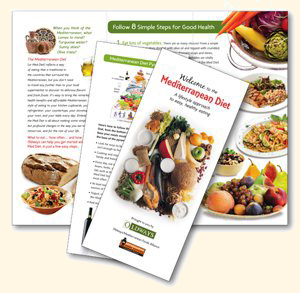 This tri-fold brochure, available either as a or in hard copy, provides these 8 simple steps to get you started eating the Med Way! To purchase hard copies of the brochure, please visit our Oldways store.